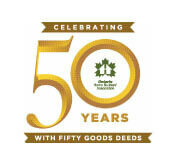 It was last September when OHBA President Eric DenOuden proposed that OHBA celebrate its 50th anniversary with 50 good deeds and he had no concerns that the target number could be easily met. “Our local associations, the individual members and member companies across Ontario are extremely generous and community-minded people, so I had every confidence that we would have at least 50 good deeds to commemorate OHBA’s historic anniversary,” said DenOuden. And he was so right. With almost two-thirds of OHBA’s 31 local associations participating in at least one good deed project, and dozens and dozens of companies and individuals contributing to the celebratory initiative, the half-century goal was vastly surpassed. What follows is a sampling of some of the initiatives—as varied and unique as our local associations and members are in communities across the province. Eager to launch the 50 Good Deeds initiative, the Stratford Area BA (SABA) partnered with several local businesses and leaders in the community and broke ground for the sod-turning of the Stratford Splash Pad last summer. One year later, the Splash Pad welcomed excited children who raced to be the first to try out this water wonderland at its official opening in July. SABA was more than just the brawn for this initiative. On top of the more than $200,000 that members donated to the development of this park, volunteers from the association worked endlessly to ensure the park would be open, safe and available to families for summer fun. Simcoe County HBA’s annual Ice Fishing Tournament raised $33,000 for local charities. This is the 15th year this event has been raising donations for Simcoe County charities. The Guelph and District HBA participated in the second annual Trees for Tots event, which raised $28,000 for a donation to the Children’s Foundation of Guelph and Wellington. The Waterloo Region HBA (WRHBA) has been very active in its community and this year focused on a six-week renovation project that transformed existing space into new offices, as well as a common gathering and reception area at the Ray of Hope Community Centre in Kitchener. WRHBA tradespeople, contractors and industry stakeholders lent their skills, expertise, time, talent and donations to offset the construction costs, while allowing Conestoga College students to experience a ‘living classroom,’ where they were exposed to best building practices. This past spring, members from the Peterborough & Kawarthas HBA joined together for the 4th Annual Chair Challenge. Members worked together to build Muskoka chairs that were later sold to raise funds for the Five Counties Children’s Centre. The Hamilton-Halton HBA presented a $2,500 bursary to a student of Mohawk College in the construction and renovation program. The HHHBA launched this bursary program with Mohawk two years ago and hopes it will lead to great successes and help graduates successfully start their business. The Saugeen Home Builders’ Trade Association donated $500 to the Bluewater District School Board for the Ontario Youth Apprenticeship Program’s 10th annual Secondary Regional Technological Skills Challenge. Every year, members from the Hamilton-Halton HBA support their annual winter holiday party and Children’s Toy Drive. This year’s toy drive brought in 135 new toys for children between the ages of 9-15, with all toys going to City Kidz, a non-profit organization committed to transforming the lives of inner-city children, breaking the cycle of hopelessness and ending child poverty. The Niagara HBA and OHBA hosted ‘Fun on the Ice,’ a charity event that invited members to skate with former NHL hockey stars Steve Ludzik and Rick Vaive. Sponsored by Empire communities and Mountainview Homes, the event raised over $3,000 for the Steve Ludzik Parkinson’s Rehab Centre. The 2014 Builder Baseball charity softball tournament raised $30,000 for BILD’s Community Partner Habitat for Humanity GTA. Quinte HBA members raised $5,000 in donations for the Three Oaks Foundation for the Second Stage Housing Project in Belleville, a shelter and service foundation for abused women and their children. 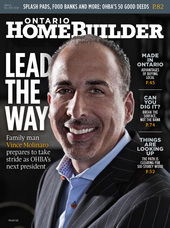 The Greater Ottawa HBA’s Blitz Build was the talk of the town in Ottawa this past spring. Teaming up with Algonquin College students and the Habitat for Humanity National Capital Region (NCR) team, GOHBA challenged itself to build a two-storey home within 72 hours—and succeeded. With students from the college assisting with planning, promotion and construction, the Blitz Build did more than provide a new home for a family. The house will be sold on the open market, with all proceeds benefiting Habitat for Humanity NCR. Tribute Communities, Durham Region HBA and regional chair Roger Anderson co-hosted the Building Industry for Durham Deeds (BIDD), raising more than $250,000 for WindReach Farm and Hearth Place Cancer Support Centre. London HBA donates hard hats every year to students of Fanshawe College as part of its initiative to help youth get into the trades and reinforce the message of safety on construction sites. The Grey-Bruce HBA is a regular donor to the Festival of Northern Lights and provides an annual bursary to a student at West Hill High School looking to enter the building trades. The Windsor Essex HBA built a model house and donated it to the Windsor Children’s Safety Village in order to assist in demonstrating jobsite hazards in a home under construction. The Brantford HBA raised $5,000 for the Steadman Community Hospital at its annual Industry Luncheon with keynote speaker Haley Wickenheiser. Admission to Chatham-Kent HBA’s 3rd Annual New Home & Reno Expo included a $2 donation to CKHBA’s charitable work. Proceeds supported the X-Ray Equipment Campaign of the Chatham-Kent Hospital Association Foundation. Intercity Realty sent a team of florists and designers to decorate seven homes in King/Vaughan in their holiday best. The final product was later featured in a two-day home tour, with all proceeds going to the Women’s Centre of York Region. Peter Gilgan, president and CEO of Mattamy Homes, donated $30 million to St. Michael’s Hospital in downtown Toronto to help build the new 17-storey patient care tower. Dunshire Developments hosted a charity Texas Hold’em Poker Tournament, with all proceeds going to Sick Kids Hospital. The event is part of the Lights, Camera, Imagine campaign that is dedicated to providing unforgettable memories to children who may be faced with life-threatening illnesses across Canada. For 17 years, the Haliburton County HBA (HCHBA) has been raising money in a truly Canadian way—an ice hockey tournament. The traditional event started when HCHBA Executive Officer Aggie Tose walked into a food bank shortly after Christmas and noticed how empty the shelves were. From that point onward, HCHBA has hosted a food drive and raised funds to support local food banks in the Haliburton County area. As a result of this initiative, Haliburton food banks received over 20,000 food donations to support local families in need. Madison Homes and Fieldgate Homes (Team Madfield) took part in the Bike4Chai and raised over $500,000 for Chai Lifeline Canada, an organization that assists families with children who are born with life-threatening illnesses. Kylemore Communities’ Annual Holiday Party Toy & Gift Drive resulted in hundreds of donations to the Unionville Alliance Church (UAC). The UAC will use all donations to serve 175 families in the local community and each family will receive a food hamper including a turkey and presents for all family members. Durham Region HBA member RBC donated $20,000 to Habitat for Humanity Durham for the Women in Power Build campaign, of which DRHBA President Jennifer Hurd is an ambassador. A $5,000 grant from Union Gas was awarded to Leadership Waterloo Region. Tailored for busy professionals, the Leadership Waterloo Region program provides an opportunity for participants to explore their personal leadership styles and practice leadership skills in a group setting. Hats On for Awareness, co-founded by Enza Checchia of Decorenza, held a fundraising gala that saw more than 400 people gather to raise money and awareness about mental illness and addiction. The fifth annual Hatsquerade event raised $50,000 for the Centre for Addiction and Mental Health. Geranium Homes presented a cheque for $5,500 to support Habitat for Humanity Northumberland. Heathwood Homes COO, Bob Finnigan and the Mikey Network presented a cheque for $160,000 to fund the first year of operations for the Mikey Young At Heart program in the Peel District School Board. Heathwood’s donation kick-started the wider campaign to raise funds for the special initiative, which places defibrillators in Peel area schools. Founded by Alfredo De Gasperis and chaired by the trio of Jim V. De Gasperis, President and CEO of Condrain Group; Marc A. Muzzo, President, Pemberton Group; and Bill Fisch, Chairman and CEO of the Regional Municipality of York, the 32nd Annual Building Industry Luncheon raised more than $829,000 in support of United Way York Region’s In Every Neighbourhood initiative, a three-year commitment to provide 325,000 helping hands for people in municipalities across our region. Reid’s Heritage Homes’ 12th Annual Orin Reid Memorial Golf Tournament raised $10,000 for the Collingwood G&M Hospital Foundation. Marz Homes held the 14th edition of the Marz Homes Golf for a Cure Tournament, raising $40,000 to support the Canadian Cancer Society. Madhouse Advertising sponsored the New Beginnings Prosperity Ball this past winter, a fundraiser in support of single mothers and their children. Its goal is to help empower women to become self-confident, self-sufficient, career-oriented and employable. The Daniel’s Corporation partnered with Habitat for Humanity GTA to make the dream of home ownership a reality for one lucky family. The company will contribute a townhome for the family of four within the Daniels FirstHome Aurora community on Bayview Avenue. Organized by BILD, the annual Stephen’s Ride for Humanity is taking place on September 21 at Eagles Nest Golf Club, with all proceeds going to Habitat for Humanity GTA. The annual ride began in 2011 and honours the memory of BILD’s CEO and president Stephen Dupuis. Empire CommunitieS donated $33,000 to the David Hornell Jr. School in Mimico to complete an outdoor classroom that will include a butterfly garden, native shrubs and trees, accessible paths, as well as log benches and rock seating for the students. Brightstar Corporation, Brookfield Homes, Lormel Homes and Geranium Homes have signed on in support of Lake Simcoe Conservation Foundation’s Inspiring Greener Communities program. Each builder is committed to support critical restoration and protection projects for each home that closes in their Lake Simcoe watershed communities. Many OHBA members, staff and member companies also accepted the ALS Ice Bucket Challenge this summer to raise awareness of ALS, an illness that claimed the life of OHBA Executive Director David Horton in 2011.